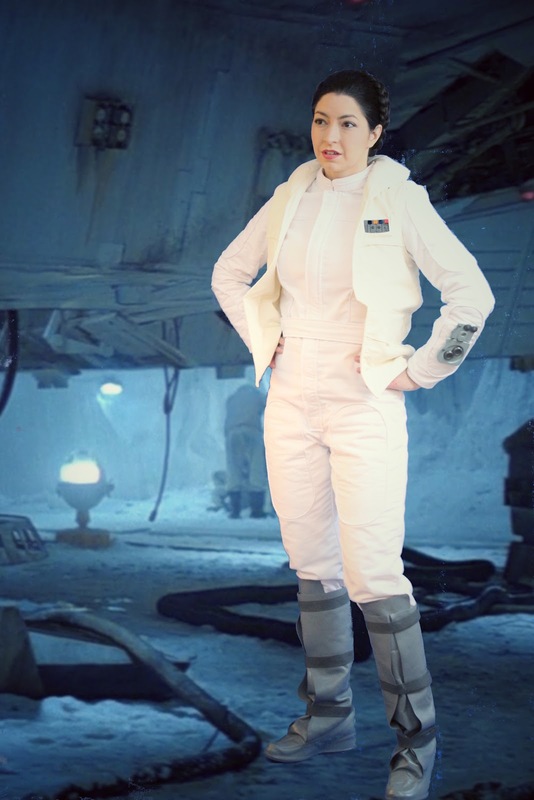 I think my favorite thing about Hoth Leia so far is making lots of faces at the camera - channeling Leia's reactions to Han! Maybe some day I'll make a Hoth or ESB version of Han for my husband so I can make faces at him on camera while wearing this. . . although if you've seen any pictures of us together in Han and Leia you'll know he can't keep a straight face. But I love his smile, so I can't really complain! It was made to fit - Chest 37/38", Waist 30", Hips 39". Those measurements don't include the lightly insulated snowsuit. I ended up using VERY narrow seam allowances on the side seams and front seams, as I wasn't happy with how narrow the front opening was at first. I took some progress photos as I worked. Let me know if you have questions! Here's the collar before I stuffed it. I used a water soluble marking pen (affiliate link) to mark the location of the ID badge holder. I sewed the id badge holder by sewing on the middle blue rectangle. I cut the seam allowance on the innermost blue rectangle, clipped the inner corners, and turned it inside out. Fun fact - the quilting pattern is different on the left and right sides. I included both sides in my pattern. Would you like functional pockets? WHO DOESN'T?????? You can use the pocket flap placement line as the top of an extra piece. Pinning the collar to the outer layer. This will get sandwiched between the outer layer and lining. Lining! Made of the same fabric as the outer layer. I can't link to the fabric I used, as I actually used an old bed sheet I got from a thrift store! Cheap and eco friendly! On the pattern you'll see there's a section on the collar where I have the original cutting line marked, as well as my actual cutting line. I wanted the collar to end a bit before the front corner, so I trimmed off the part that extends above the lined section. And now, the magic that is sewing a lined vest! I hand finished the hole I'd left open to turn it right side out.